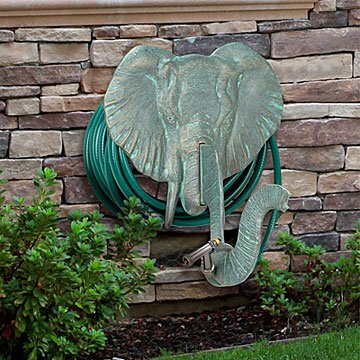 Poking out from the hedges is a majestic jungle friend: This elephant who's kind enough to hold your hose. At the watering hole, wild elephants use their trunks to take long pulls of cool water and splash away the day's heat. In your garden, their trunks have a very different purpose: holding your hose. Inspired by the majestic jungle animal, metal artists in Michigan handcraft this functional design from recycled aluminum. The included hardware makes hanging it outside your home or garage a cinch. Choose from classic grey, a slight patina finish, or bronze, and give it to your best animal-loving friend. Handmade in Michigan. I love things with faces and personalities. He came very well packaged and, as long as his installation is secure, I will love having him greet me each day.